The Pindos Mountains, consisting of a calcareous shale were created 35 million years ago by accumulation of marine organisms and shells sediments. These processes took place at the bottom of the Ocean of Tethys, a primordial large inland sea. Today’s Mediterranean formed from the remnants of this sea. The upheaval of this surface has formed the Pindos mountains. The topography of the area is characterized by stony slopes, cliffs, scree, potholes and the spectacular gorge of Vikos (20-25 kilometers long). 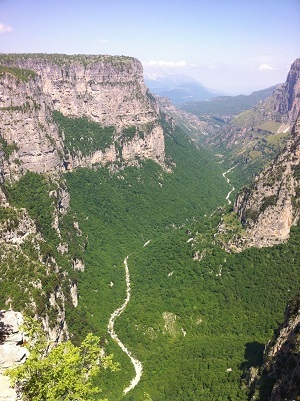 The Vikos Gorge, is referred to in the 1997 Guinness record as the deepest narrow gorge worldwide (depth 900 meters and width 1,100 meters).